He was born in New Haven, Connecticut, of Irish Catholic extraction, the son of Michael Charles "Mike" Murphy, athletic trainer and coach, and the former Nora Long. He was educated at Trinity-Pawling School, Peddie School and Yale University in his native New Haven. He worked as a tool maker for the Ford Motor Company, as a miner, a real estate agent, and a night club dancer. In movies, Murphy was famous as a song-and-dance man, appearing in many big-budget musicals such as Broadway Melody of 1938, Broadway Melody of 1940 and For Me and My Gal. He made his movie debut shortly after talking pictures had replaced silent movies in 1930, and his career continued until he retired as an actor in 1952, at the age of 50. In 1964, he was elected as a Republican to the Senate, having defeated Pierre Salinger, the former presidential press secretary in the Kennedy White House, who had been appointed several months earlier to serve the remainder of the late Clair Engle's unexpired term. 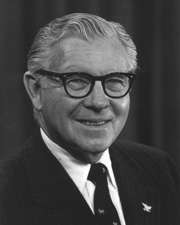 Murphy served from January 1, 1965 to January 3, 1971. Murphy assumed his seat two days early, when Salinger resigned from the seat in order to allow Murphy to gain an edge in seniority. Murphy was then appointed by Democratic Governor Pat Brown to serve the remaining two days of Salinger's term. His election attracted the attention of satirist Tom Lehrer who wrote and performed a song about him. Murphy was in demand for a time to assist other Republican candidates seeking office. In 1966, he came to Georgia to host a fundraising dinner in Atlanta for U.S. Representative Howard "Bo" Callaway in the first gubernatorial campaign undertaken by a GOP candidate since the Reconstruction era. Callaway ultimately lost the election when the state legislature resolved the impasse and chose the Democrat Lester Maddox to fill the position. In 1967 and 1968, the year Richard M. Nixon was elected as U.S. President, Murphy was the chairman of the National Republican Senatorial Committee. In 1970, Murphy ran for reelection but was defeated by Democratic U.S. Representative John V. Tunney, the son of famed heavyweight boxing champion Gene Tunney. During his Senate term, Murphy suffered from throat cancer, forcing him to have part of his larynx removed. For the rest of his life, he was unable to speak above a whisper. Murphy's staunch support for the lingering Vietnam War worked against his reelection, as did reports that he continued to receive a salary from Technicolor after taking office'. As the general election approached, Tunney overtook Murphy in the opinion polls. Tunney's successful Senate race in 1970 was reportedly the inspiration for the 1972 Robert Redford film The Candidate. Murphy subsequently moved to Palm Beach, Florida, where he died at the age of eighty-nine from leukemia. Murphy's move from the screen to California politics paved the way for the successful transitions of actors such as Ronald Reagan and later Arnold Schwarzenegger. Reagan once famously referred to George Murphy as his own John the Baptist. Fellow Republicans praised Murphy's ability to speak at fund raising dinners and consequently backed his bid to become the chairman of the Senate Republican Campaign Committee. During his tenure in the Senate, Murphy created the candy desk by placing a supply of confectionery on his desk on the U.S. Senate floor. After 1971, the candy-desk duties were bequeathed to a string of successors; since 2015, the keeper of the candy desk has been Pennsylvania Republican Pat Toomey. Murphy was married to his ballroom dancing partner, Juliette "Julie" Henkel-Johnson, from December 18, 1926, until her death in 1973. They had two children, Dennis Michael Murphy and Melissa Elaine Murphy. He was married to Bette Blandi from 1982 until his death in 1992. His widow died in 1999. ↑ In 1944 Democrat Jimmie Davis (1899–2000)—popularizer of "You Are My Sunshine"—was elected to his first term as Governor of Louisiana. In 1948 Grand Ole Opry star Roy Acuff won the Republican nomination for Governor of Tennessee but was defeated in the general election. ↑ George Lloyd Murphy, Biographical Directory of the United States Congress. Accessed February 27, 2011. ↑ New York Times, "George Murphy, Singer and Actor Who Became Senator, Dies at 89." ↑ Weaver, Warren (8 December 1966). "Murphy Is Urged to Challenge Liberals for G.O.P. 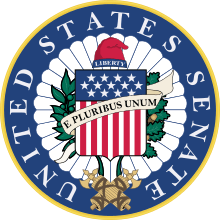 Senate Job; He Is Backed to Oppose Scott as Campaign Unit Leader Dirksen May Decide". New York Times. Retrieved 8 October 2014. ↑ Zan Thompson (12 June 1986). "The Personal Side of George Murphy at Age 83". Los Angeles Times. Retrieved 11 December 2012.